Heather attained her Bachelor of Technology degree in food engineering from Massey University in 1999. She then spent 10 years in gelatine manufacture in a variety of roles including quality assurance, production management and process improvement engineering before returning to academia to start a PhD in 2010. In 2015 she completed her PhD study into the rheology of biopolymer soft particle suspensions, supervised by Professor Jason Stokes at the University of Queensland. 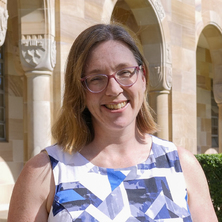 She has since continued at UQ in postdoctoral roles investigating the relationship between rheological properties, food structure and sensory perception of both real food products and model soft particle suspensions. In my Postdoc position, I have developed further understanding of soft particle suspension behaviour under confinement, such as occurs between tongue and palate during consumption of food or between skin surfaces during application of skin creams. I have been part of a team developing a new rheological method to measure and interpret rheological behaviour of suspensions where the gap between rubbing surfaces is of the same order of magnitude as the particle diameter. Under these conditions, suspension rheology is a function of particle micromechanics. I have used model systems of polysaccharide particles to develop the relationship between particle and suspension microstructure, narrow gap rheology, tribology and sensory for non-interacting particles. The key outcomes from the project have allowed our industry partner to move towards rational design of food products. The success of this work contributed towards their support for a successful ARC linkage project 2017-2019.